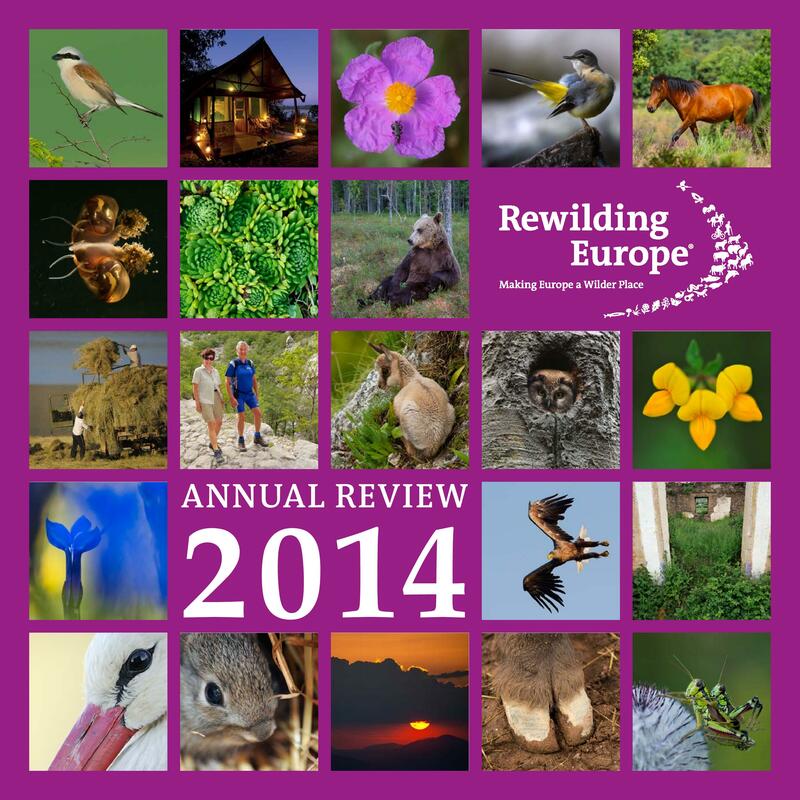 In its third Annual Review, Rewilding Europe reports back on its achievements in 2014. Building a sound base during the first three years of the initiative to create lasting results in the longer term, started to pay off in various ways. Significant milestones and tangible results were achieved within the three main pillars of Rewilding Europe: rewilding, enterprise and communication. With restarting the Eastern Carpathians and adding the Rhodope Mountains, Rewilding Europe was active in seven rewilding areas in 2014, while two other areas were prepared to become part of the initiative: the Oder Delta and Greater Laponia. Important strategic partnerships were established at a European level and in the rewilding areas, while legal entities were set up in Croatia, Italy and Bulgaria responsible for the work in those countries. Overall, some 52 people were involved in the initiative, working from 13 different countries. The funding base and the number of partners and sponsors also increased further. Main rewilding highlights in 2014 were the beginning of building a wild bison population with the first herd of 17 animals released in the Southern Carpathians in Romania; seven natural grazing projects established in 4 different rewilding areas; five Tauros breeding sites now operational in three countries; and cooperation with hunting associations on wildlife comeback in three areas. All these rewilding pilot sites together cover a total surface of some 20 000 hectares, based on management, grazing, or hunting rights. The Wildlife Bank grew to 227 animals, while the European Rewilding Network counted 35 members by the end of the year, encompassing a total surface of just over 1,9 million hectares. In the enterprise component, major progress was made with supporting local entrepreneurs and communities that have the potential to revitalise rural communities and develop rewilding enterprises. Through technical, financial and promotional support we engaged with some 40 different enterprises in six rewilding areas. Through Rewilding Europe Capital, we provided financial loans to 16 different businesses in five countries, creating or supporting more than 30 jobs. The Travel Club grew towards some 3 000 members, while we developed 15 different travel itineraries for six rewilding areas. Main communication highlights in 2014 were linked to our specific rewilding and enterprise achievements, while we continued to have a large outreach through many different media in, and outside Europe. The bison release in Romania already reached some 95 million people. The Annual Review 2014 covers specific progress for each of the seven rewilding areas, and many developments at the general level. It provides numerous quantitative data based on the results of an extensive monitoring framework that has been developed, measuring over 40 indicators to track progress on a yearly basis. The Annual Review 2014 can be downloaded here. Previous Annual Reviews are available online here. Hard copies can be ordered by email.